The Axia Mira LED 50 has an easy to use control pad for controlling light functions, including Five Dimming Levels and an Endo mode. 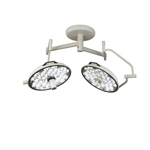 The removable handle is ergonomically positioned off to the side to maximize the light field and can be rotated to electronically focus the beam to a concentrated 6.5” (16.51 cm) for surgical procedures or 12” (30.5 cm) for broader examinations. Slim design to reduce clutter in small workspaces. Lightweight long arms allow for easy positioning. The Latest LED technology offers high CRI of 95 and 4500 Kelvin for excellent color accuracy. Twist handle for focusing light beam.